So i picked a kwickset smart key lock and the the thing has not been right since. the key doesn't work and is generally on the fritz. is this common? why does it happen? is there a way to avoid it? PS, a breakdown of the lock would be great if someone knows of one. I think the inards in those locks have some plastic bits in them. Not very strong. Sounds like most of the ones I've picked on for longer than a couple minutes too. It happens because the tiny metal tabs that grab the wafer get rolled over because you're causing friction by tensioning then moving the parts around. It either moves the wafer and recodes that spot, or drops it all together out the bottom of the cylinder where it jams up in the housing. The only way to avoid it, is not to pick it with your standard tools. Tooly, good info there too! Thanks! Kwikset makes cheap locks, they always have, the minute I seen the new smartkey lock, I figured it was the same quality as all there other stuff. Home Depot pushes these locks on everybody, funny thing is, I was chatting with the guy in the lock area, and he said that the counter display has been replaced several times already because of them breaking! 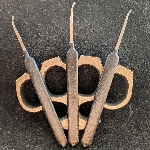 Alot of hype for a lock with a clever design just poor materials. Ok, this is good to know for future use. i kinda had a feeling that it was just a very delicate mechanism built with crappy parts. unfortunately the lock was in use, a friend of mine lost his keys at the gym so i helped him out. (i know it was his place because iv been there more times than i can count). luckily i had another kwickset cylinder laying around and pinned it up to his backup keys. 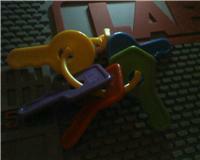 on a side note the smart key was much more difficult to pick than regular kwicksets, is this common? smart keys are a pain to pick bro, im impressed that you got it. Pokey wrote: "Come and get me, loser! Spankity spankity spankity!" 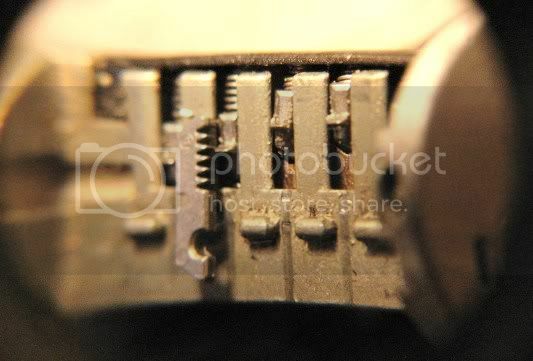 From what I've heard is that you have to set it to a new key after its picked because the wafer placements are lost. Or something like that. everybody that I have talked to that have picked these says that 99 percent of the time the owners key will work but the lock itself can no longer be rekeyed, picking them renders that part useless because of the mentioned parts that get bent or fall apart. that does not make sence. the rekeying part is like 1/3rd of the cylinder. 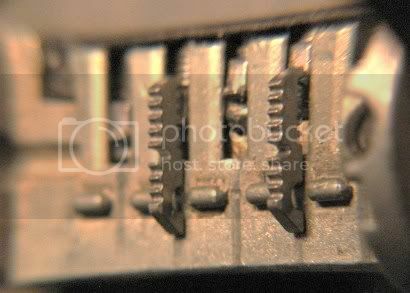 ChemicalRobot wrote: From what I've heard is that you have to set it to a new key after its picked because the wafer placements are lost. Or something like that. Something like that indeed... it's what I was trying to explain without using specific terminology not everyone is gonna want to follow. Least of all me. Force tools aside, lets talk about picking. Barbarian was kind enough to post the lockwiki breakdown. It doesn't get much more clear than that I'm afraid, but I had these pictures, so I'm using them. Here is the inside of the lock with all but two wafers removed and the proper key inserted. See the metal tab on the side of the keypin that holds the wafer? When you tension the lock and the sidebar presses in on the wafer, there are several things that can happen to allow that little metal tab to deform depending on the individual machining. Sometimes it smashes a notch in the tab, other times you have to lift the binding pin to bend it. The result is the same, failure. What I was trying to take a picture of here is the second tab. See how it looks shorter? It just drops the wafer to get jammed in between plug and housing. I'm not a snob about security on low end residential stuff. I mean regular generics and kwiksets are perfectly adequate for most applications, and masterkeyable. Making this lock much less resistant to abuse for the sake of bump resistance and end user keying was a step in the wrong direction. If you pick a smartkey, do so with a light touch and don't be suprised when you start to experience complications. wow. tooly this is exactly what i was looking for. very nice job. So nice, I vote that it be stickied in the locks section for future inquiry.